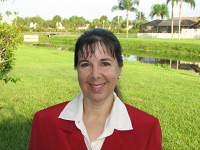 Elena del Valle, editor and host of Hispanic Marketing & Public Relations. Well, today I have the honor of publishing a Q&A post from a remarkable modern communicator, Elena del Valle, the Miami-based editor and host of HM&PR. Full disclosure: Elena and I have never met, but we’ve communicated regularly online. First, a biography on today’s interview subject. Elena directed and edited Hispanic Marketing & Public Relations Understanding and Targeting America’s Largest Minority and is editor and host of the companion website and podcast. Prior to founding her own marketing and public relations firm, she was a key member of the health care team and headed the Hispanic practice at the largest independent public relations firm in Florida. Before that, she attended law school nights while she was in charge of domestic and international Hispanic marketing and public relations for a major private South Florida health care company. She is the recipient of the 2004 D. Parke Gibson Pioneer Award Multicultural Communications Professional Interest Section of the Public Relations Society of America (PRSA) and the 1988 Up & Comers Award in Public Relations. Multilingual and a published author, she is a graduate of Leadership Florida, Leadership Miami, the Center for Creative Leadership, the National Hispana Leadership Institute, the Embassy of Spain Young Hispanic Americans, the Cuban American National Council, and the Harvard John. F. Kennedy School of Government leadership programs. Elena is a graduate of the University of Miami with Master in Business Administration and a Juris Doctor and is founding president of the Hispanic Marketing & Communication Association. She is past chairwoman of the National Public Relations Society of America, PRSA, Multicultural Section, a past member of the prestigious PRSA Counselors Academy, a past judge of the PRSA Silver Anvil Awards and a past member of the PRSA National Advocacy Committee. Most recently, she was selected to 100 Latinos Miami. Given this impressive career, one wonders: When does Elena find time for sleep! Seriously, we’re thrilled she found time for The PRDude. Q. What prompted the launch of Hispanicmpr.com? Did you see a void in the market? Yes. After the book was published there were updates about the market and the authors, and we wanted a place to connect. The website was initially designed to continue the conversation we began with the eponymous book (http://www.hispanicmpr.com/the-book/), the first Hispanic marketing title selected Choice Outstanding Academic Title. In time, my fellow authors had no time to make updates and I took the lead. We added video capability. The website topics expanded to business and I launched a podcast program where I interview business leaders and news makers. Q. Is there a difference in strategies and tactics when launching communications to the Hispanic market versus the more mainstream market? If so, please elaborate. As with any other market segment it pays to subdivide a target market into manageable segments or slices. The United States Hispanic market is so large that it makes sense to figure out which portion of the market you want to target before launching any campaign. For example, you can reach out to English dominant, Spanish dominant, bilingual Hispanics or SciFi lovers or soccer fans, wine lovers, new moms, students or any other number of groups. At the end of the day, much of the growth in the country is coming from emerging markets, and among those the Hispanic market is considered by many the most prominent. This means anytime you reach out to the mainstream you are automatically reaching Hispanic consumers whether you mean to or not. The clearer you are about the characteristics of your primary market segment, the more effective you can be at reaching its members. That premise applies equally among Hispanic consumers as it does among mainstream and other market segments. Q. 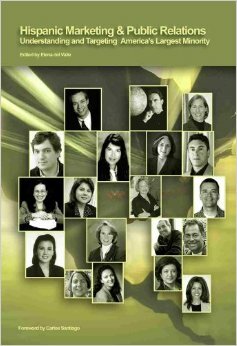 In addition to the Hispanic Marketing & Public Relations book, you’ve written many articles about business, marketing and public relations and Hispanic markets. Let’s get your perspective on where the communications industry is headed. What’s the next major development? There are so many changes taking place that continue to revolutionize our lives and the way we do things it’s difficult to know what to expect for any industry. The places and ways we communicate, consume news and the media themselves continue to evolve. At the same time media outlets are struggling to keep up with the technology and consumer migration to digital formats while making a profit. No one knows what the solution will be in the long term. In the interim savvy business people will continue to remain aware and adapt. Communicators will always play a role in society, I think, because there will always be people better at communicating and more inclined to communicate than others. Having said that, as the economy remains sluggish with hardly any growth (about 1 percent a year) in Europe and only slight growth in the United States (2 percent or so a year) efficiency in business and among communicators will be at a premium. It’s more important than ever to provide value and convey to senior executives, in a language that they understand, the significance of such measurable value within the company. Now it’s your turn. Do you have any thoughts to share regarding communicating with the Hispanic market?